Bath City FC has always been well supported by local businesses in its 125 years of existence and this season is no different. 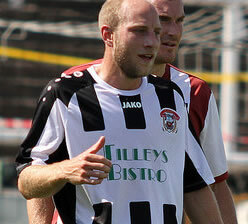 Tilleys Bistro will appear on the front of Bath City’s home and away shirts in their 125th Anniversary season. Dave Mott of Tilleys, who has a long association with the Club, was thrilled at being drawn out first and is looking forward to developing stronger links with the Club in the coming season. Bath City FC also announced a new sponsorship deal for their Academy from German manufacturing company Joseph Rettenmaier & Sons (JRS), whose UK sales agent are AJM Pet Products, owned by Bath City director Andrew Pierce. The arrangement will see the JRS logo on the front of the shirts, and came about when JRS sales director, Gerhard Auer, himself a keen Borussia Monchengladbach fan, heard about the Bath City Academy, and the excellent results it was getting, both in keeping young people in further education, and developing their football skills at the same time. JRS is very much a community focused company, being the largest employer in the area surrounding the small town of Ellwangen in Southern Germany, and supports projects both in the local area and around the globe that are aimed at helping young people. Mr Auer said, “JRS is delighted to be sponsoring the Bath City Academy, and support the excellent work it is doing. We wish the Academy every success for the coming season, and will be watching the results with interest”. Bath City Chairman Paul Williams said, “With the move to the City of Bath College from next season this is a very important time in the development of the Academy, and I would like to thank JRS for their support”. Country Care Homes have become match day programme sponsors this season and are owned by City fan Chad Doveton.